Breakout Capital’s Founder & CEO, Carl Fairbank was named one of D.C.’s top entrepreneurs under 40 years old by Trending 40. The list recognizes entrepreneurs who have made significant contributions in their industry and have taken the Washington, D.C. region by storm. In addition to becoming one of the fastest growing companies in the market, Breakout Capital is a leading advocate for small business, fighting for improved transparency and the adoption of best practices by alternative capital providers. Breakout Capital’s Founder & CEO, Carl Fairbank, has been recognized in the 2016 Trending 40’s list of D.C.’s top entrepreneurs under 40 years old. Washington, D.C. has become a hotbed of entrepreneurship and the list recognizes many great young entrepreneurs who built innovative companies in the area that have made a significant contribution to their industry and the region. Founded in May 2015, Breakout Capital is a technology-enabled direct lender that provides simple, straightforward working capital solutions to small businesses. Under Fairbank’s leadership, Breakout Capital has achieved significant growth, already providing nearly $10 million of working capital to hundreds of small businesses across the country. In addition to becoming one of the fastest growing companies in the market, Breakout Capital is a leading advocate for small business. Breakout Capital has produced a highly regarded “educational series” through its blog, Breakout Bites, that helps small businesses better understand the alternative lending market and how to avoid the hidden fees and debt traps that are too prevalent with many of its competitors in the market. Fairbank is an active thought leader on Capitol Hill, advocating for improved transparency and the adoption of “best practices” by alternative capital providers throughout the market. Breakout Capital has taken a public stance in support of Federal regulation to eradicate bad practices and create a single regulatory framework to institute industry-wide transparency and clear product and cost disclosure. Breakout Capital is a steering member of the Coalition for Responsible Business Finance (CRBF), a group of lenders, small business organizations, and small business advocacy groups that aims to bolster the trust and credibility of the industry through responsible business practices while ensuring that alternative products and services meet the needs of America's small business community. To learn more about Breakout Capital and the CRBF visit breakoutfinance.com or responsiblefinance.com . Breakout Capital, headquartered in McLean, VA., is a small business funding company providing a wide range of working capital solutions to small businesses across the country. Breakout Capital’s product suite includes small business loans, business cash advances, SBA loans, and a wide range of factoring solutions. 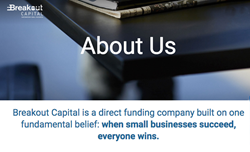 Leveraging the management team’s extensive experience, Breakout Capital provides each small business client with an innovative, tailored funding solution. With a laser focus on honesty, integrity, transparency, and flexibility, Breakout Capital is changing the financial landscape for the millions of small businesses in need of funding. For more information, visit http://www.breakoutfinance.com.